Olympus Stylus XZ-2 iHS review: promising point and shoot or prospective pro-level camera? High-end enthusiast orientated digital compact cameras like this one promise high-quality imagery in a very small form factor. The Olympus XZ-2 iHS measures just 113 x 65.4 x 48mm (4.4 x 2.6 x 1.9″) and weighs 346g (12.20 oz ) but packs a 12Mpix 1/1.7-inch type (7.44×5.58mm) backside illuminated (BSI) CMOS sensor. This is attached to a stabilized platform, much like the firm’s 4:3 cameras and features a 6-24mm f/1.8-2.5 (28-112mm equivalent in 35mm terms) iZuiko-Digital branded zoom lens. One nice control feature of the XZ-2 is the Hybrid control ring surrounding the lens, it can be used to alter a number of settings including aperture values, shutter speeds and adjust EV compensation among others. The XZ-2 also has a tilting 3-inch touch-sensitive screen and provision for an optional electronic EVF (the same finders as the firms’ 4:3 models) although at $600, the addition of either the $160 VF-3 or higher-res $249 VF-2 makes the combination pricey. Like rivals, the upgrade to CMOS technology allows Full HD video (1080p) as well as 720p video at 30fps, and a doubling of sensitivity up to ISO12800. The XZ-2 sees a big increase in the DxOMark score over its predecessor and other compacts from the same stable (albeit a small sample). The adoption of a new sensor out-performs the older version of this camera, the XZ1, by a substantial margin equating to a 15-point difference in our DxOMark scores up from 34 to 49. The XZ-2 also outperforms other Raw-capable compact cameras from the firm in our database but the sample is quite small still. While that is promising, it doesn’t put the XZ-2 way above rivals however it does put it ahead slightly of the recent Canon PowerShot S110 and very close to the older and yet highly regarded S100. While we did note an improvement of just under 1 Ev in our Sports (Low-Light ISO) score from ISO 117 to ISO 216, no doubt due to the improved light-sensitive capabilities of the BSI architecture the XZ-2, there were also significant improvements seen at low ISOs. There’s nearly a 1.0 Ev improvement in the Landscape (Dynamic Range) and more at higher ISOs as well as over 1.5 Ev in Portrait (Color Depth) use case scores. The 11.3 Ev Dynamic Range is very good for a compact and better than some 1-inch sensors, such as that found in the Nikon 1 J3, but the Low-light scores continue to be well behind modern DSLRs, as you might expect. If you’re considering the $549 Olympus XZ-2 chances are that you’ll also be looking at the Canon PowerShot G15 and the Nikon Coolpix P7700, as both are priced at around 10-percent less at $499. The Canon has a tempting spec, including a similar resolution sensor and lens ‘speed’ but with slightly longer zoom range from 28-140mm (the longer focal lengths accounting for f/2.8 max aperture at 140mm). It also image stabilization, sensitivity up to ISO12,800 and has a built-in (albeit small) optical viewfinder. However, while the Olympus sensor performs similarly in general terms it should potentially be more suited to portraits with its higher Color Depth (equating to around 0.5 stop more) than the Canon G15, though in real world use the differences are too low to be obvious in images. Although the measurements are close, the Nikon P7700 has an additional 0.47Ev in Dynamic Range at base ISO over the Olympus XZ-2. Compared with the Nikon, the XZ-2 can’t quite match it in Color Depth or Dynamic Range. Qualitatively, the improvements in image quality wouldn’t be noticeable and that’s also likely true in the Low-Light ISO scores, where the Olympus is ahead slightly. You might see performance differences between the Canon and Nikon but the XZ-2 sits in the middle of those two in terms of the quality of sensor output. The Nikon, however, is a very strong challenger. Not only does it have the longest zoom range, equivalent to 28-200mm, only a slightly ‘slower’ f/2.0-4.0 maximum variable aperture, and useful articulated 3-inch rear screen but, with a DxOMark score of 53, it performs very well indeed. It’s also about $50 cheaper. It’s also worth noting the decision to drop the optical finder of previous iterations may be a shortcoming for some users, especially as there’s no option to add an electronic finder. 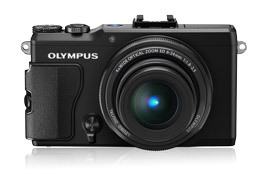 The Olympus has a choice of two models, both originally designed for their micro 4:3 bodies but no less compatible with the XZ-2. Another contender in this category is the recently tested Panasonic Lumix DMC-LX7. Although it has a slightly lower 10-Mpix resolution CMOS sensor it’s more accessibly priced at around $450. It is also built around a high-grade Leica-branded zoom lens, equivalent to a 24-90mm f1.4-2.3. Not only is it theoretically, two-thirds of stop ‘faster’, the wider field of view at 24mm is a particularly attractive feature for interiors, landscapes and architecture. In our labs, the Lumix DMC-LX7 tested similarly to the Olympus with an overall DxOMark score of 50 vs 49, respectively. Most of the gains, which were slight, were made in Color Depth and Dynamic Range although with around 0.5 Ev advantage, the Olympus sensor is the better of the two in low–light. Although Olympus hasn’t updated the lens, the redesigned body, with its tilting screen and in particular the new sensor, means the XZ-2 compares favorably with the latest offerings from rivals. Its overall sensor performance scores are a significant improvement on the original XZ-1 and easily measure up to the Panasonic Lumix DMC-LX7 and Canon PowerShot G15. The Olympus even nudges ahead in our Sports use case, out-performing both those models in the low-light scores. The Nikon Coolpix P7700, however, is a slightly different case. Even though it’s likely to have the same sensor as the Olympus, some performance enhancements have been made giving it the edge in Color Depth and Dynamic Range at base and low ISOs. As for low-light, the Olympus takes the lead but the scores are quite close. For even more impressive performance, particularly in low-light, larger sensor cameras should be considered, but with the exception of the remarkable Sony Cyber-shot DSC-RX100, few are as genuinely compact and as inherently flexible as these cameras.